Port Isabel Independent School District officers and local police departments attend a two-day Active Shooter Response Training held at Port Isabel High School on Aug. 8 and 9. 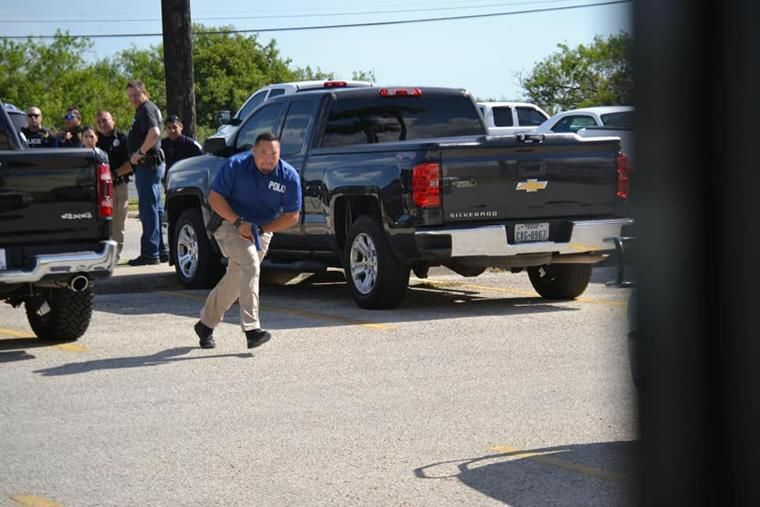 PORT ISABEL — Police officers converged on Port Isabel High School with drawn weapons. However, the guns weren’t real. They were blue and orange fake handguns and assault riffles. Local officers were engaged in training courses to help staff and students stay safe in the event of an active shooter scenario. Point Isabel Independent School District officers and nearby police departments attended a two-day Active Shooter Response Training held last week. This is the first time the Port Isabel High School campus has been utilized for this type of police training. The Brownsville Police Department hosted the event. Nearby police departments in Los Fresnos, Port Isabel, Point Isabel ISD and South Padre Island were invited to participate in the training. In total, about 20 officers attended. “By utilizing our schools, nearby police departments will be more familiar with our layouts. In case we did have a crisis situation, they would be the ones that would normally respond for our assistance,” Cabrera said. The alert program trained officers how to respond to any type of active shooter scenario, but was geared more toward a school setting. The training taught police departments how to approach and respond to active shooter situations. Most of the chief’s staff has already experienced this type of training. However, he said this was a beneficial learning experience for some of his other officers who have never been to any type of active shooter response training. “By them going through this type of course, they can work together as a team and know how each other will react or what will technically need to be done like when entering a building or a classroom,” Cabrera said. Members of the community posted their praise for the training on Port Isabel High School’s Facebook page when photos of the event were posted. “This is very proactive and something that hopefully we can continue to expand and do more scenarios or workshops together in this area in the future. That’s our goal,” Cabrera said.